Frank YangIf you want to be technical about it, territories and their associated release dates being what they are, Jessie Ware doesn’t actually have any music released in North America besides the If You’re Never Gonna Move EP, but if you think she sold out The Opera House on Saturday night on the back of that… Well it’d have been plausible, since it cherry picks three superb cuts from her debut Devotion, plus a cover and a remix, but in reality the massive success of the album in her native UK last year has already made her a genuine rising star on this side of the pond, even if the domestic edition of Devotion doesn’t come out until April 16 – essentially a meaningless date unless you’re looking to not pay import prices for an LP or something. In any case, it was a packed house and if Ware alone wasn’t enough draw, New York-based duo MS MR took the opening slot on the tour with their own respectable head of buzz. Pronounced “Miss Mister” – Lizzy Plapinger, the “miss” in question to keyboardist/vocalist Max Hershenow’s “mister” – cleared that up early on, they brought energy levels to match their day-glo streetwear aesthetic (and Plapinger’s impressively rainbow-hued hair). Under normal circumstances, MS MR would be easily filed under synth-pop, but given the way the live drums dominated the sound, that epithet felt inadequate to their heavy, earthy sound. Further, Plapinger’s vocals wasn’t the sort of light, rangy instrument you’d usually find in the genre, instead having a texture ore suited to blues or classic rock tropes – and yet here she was. The soulful set-closer “Hurricane” was probably the best synthesis of what they could and should do with the tools at hand, and while it provided a clear-cut high point, it also showed their other material wasn’t up that level yet. Maybe someday, but not yet. Their debut album Secondhand Rapture is out May 14 and they’re back for a show at Wrongbar on May 22. 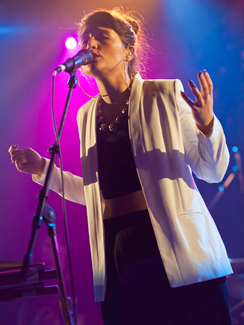 Everything about Jessie Ware – from her rich, emotive voice through the sleek, 21st-century electro-soul that makes Devotion so delicious to the black-and-white jacket and pants ensemble she wore onstage Saturday night – is elegant. She sounded divine, taking up at the front of the stage alone while her three-piece backing band all set up along the back, spending the next hour delivering heart-rending and hip-moving numbers from Devotion – all but “Something Inside” made the set list – as well as the Bobby Caldwell cover from If You’re Never Gonna Move and reprising her “Valentine” single with drummer Dornik Leigh cover Sampha’s original parts. Not that there should have been any doubt that she could sound as good live as on record, the relatively stripped-down live band arrangements gave the material a different dimension and feel, but it was still gratifying to see and experience. And yet for as good as she was musically, the trait that was most on display this evening was just how wonderfully goofy she was. If there’s any kind of manual about how an ascendant soul diva should behave onstage, Jessie Ware didn’t get a copy. Or perhaps she threw it out and instead subscribed to the Adele school of thought, which is simply “be yourself”. Ware had no airs about her whatsoever, and when not singing – and even sometimes while – was clearly having a great time bantering and interacting with the audience, posing for photos, comparing outfits, and cracking jokes; goofing with the crowd did cause a couple of flubs in the performance, but she recovered perfectly and the moments only added to the show. An argument could be made that she was more delighted to be there, for her first Canadian show, than her fans were – and they were plenty delighted. The arguable show-stopper of the night was a breathtaking “Wildest Moments”, but it wasn’t the final word as they wrapped with “Running”; there was no encore, but the job was well and truly done. At one point in the show, Ware mentioned that though this was her first Canadian performance, she had actually been in Toronto a couple years ago as a backup singer. This was probably in reference to the 2011 SBTRKT show at Wrongbar which presently gives attendees bragging rights because of a surprise Drake appearance, but in the not-too-distant future, it might be most notable as the first time superstar Jessie Ware set foot on a Toronto stage. Exclaim and BlogTO also have reviews of the show. The Georgia Straight, Stereogum, and Exclaim have interviews with Ware, and NPR has a World Cafe session. Both Ware and MS MR have just released new videos. The San Francisco Chronicle and San Francisco Examiner talk to Johnny Marr about going solo. He’s at The Phoenix on April 27. The Guardian, Village Voice, Filter, and Clash talk to James Blake about his new album Overgrown, out now. He plays The Danforth Music Hall on May 4. Clash profiles Daughter, whose debut If You Leave gets a North American release on April 30. They play The Great Hall on May 7. Beady Eye appear ready to drop their Dave Sitek-produced second album on June 10. A first, horn-infused, sample from the album has been made available to stream. In conversation with DIY, Katie Harkin offers updates on what’s been happening with Sky Larkin – including lineup changes – and confirms that their third album will be coming out this Summer. Spinner and Black Book interview head Frightened Rabbit Scott Hutchison. British Sea Power discuss their latest Machineries Of Joy with DIY and New Statesman. you’ve got Jessie right on photo 26 ! Whenever she comes back to Toronto, I think I’ll be there. Hoping though she doesn’t make the jump to Kool Haus (or God forbid, a larger venue) the next time. Hopefully, she’ll play the Phoenix.